In 1927, modernist architect Alvar Aalto entered and won an architectural competition for a municipal library in what was, at the time, the Finnish city of Viipuri. Aalto’s winning design was modified multiple times before completion in 1935. In its final form the library reflected a functionalist design with a personalised modern vocabulary evident in and informed by other projects undertaken by the architect. The restoration of the library, officially completed in 2013, reflects over two decades of international efforts, particularly cooperation between Finnish and Russian parties. The 1970s and 80s saw an increase in Finnish national concern for the library, yet it was not until the dissolution of the Soviet Union that a clear picture of the library’s conditions emerged. In 1992, the Finnish Committee for the Restoration of Viipuri Library was established and began what would evolve into a 21-year project. 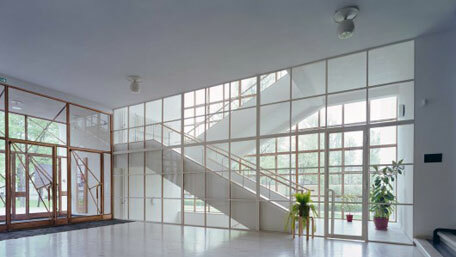 “An icon of twentieth-century architecture — with its distinctive sky-lighted roof, undulating wood-slatted lecture hall ceiling, and glass façade-enclosed staircase — the library at Viipuri is one of Aalto’s most important buildings from the years in which he was adventurously exploring a new modernist vocabulary; indeed, photographs of the building soon made him known around the world,” stated jury chairman Barry Bergdoll. Image gallery on the Arch Daily website.